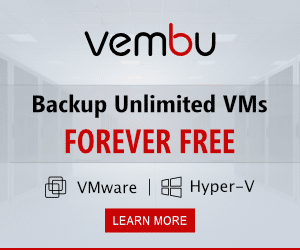 Spiceworks Users can now get their hands on NEW Vembu BDR Suite v4.0 for Free, for One Year, for hypervisors(VMware, Hyper-V) and Windows Servers. There is no need to introduce Nakivo for my reader at begin of each post. 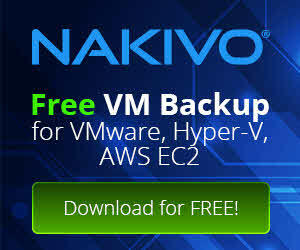 Nakivo is one of leaders in backup & replication market now. I writing reviews about Nakivo Backup & Replication since version 6.x. All new version had new amazing and useful features. Nakivo Backup & Replication v8.1 comes with two new features as well. In addition of new features, Nakivo Backup & Replication v8.1 has come with lot of improvement and fixes. Let’s review new features, improvements and fixes. Vembu BDR Suite v4.0 Coming Soon! Vembu BDR Suite v4.0 is coming with lot of new features and improvements. This post will be useful for who has Vembu BDR in their environment as backup and replication suite because I want to share the new features and improvements with you. If you are using Hyper-V in virtual infrastructure, I have good news for you, don’t miss it.